This is one of my favourite images from our trip to London in 2005. We waited until the ambient light was just right to balance with the artificial lights on the tower – allowing for proper exposure of both the sky the tower. I really lucked out with the perfect cloud cover and placement of the crescent moon to add a unique touch to a very famous and highly photographed landmark. 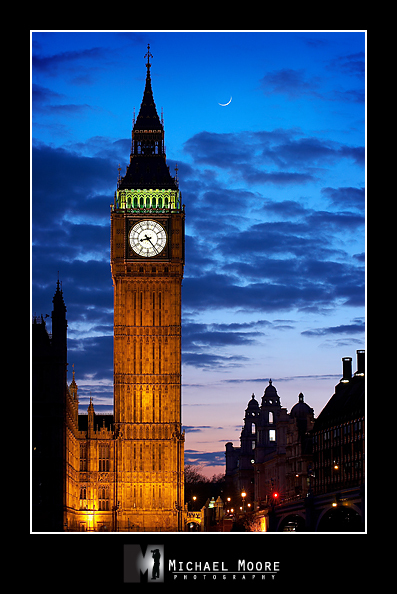 The Clock Tower in the Palace of Westminster is commonly referred to as “Big Ben” but as we learned in our bus tour, Big Ben is the nick name of just the great bell in the tower. Built in 1858, it is the largest four-faced chiming clock and the third-tallest free-standing clock tower in the world.